I don’t know how many of you out there have really known, but I’ve had some computer trouble recently. I didn’t want to post on it until it was all better, but here’s the story. For this manicure, I started with one coat of Color Club’s Vitabase Coat and one coat of Color Club’s Smooth Operator. I then used one coat of Rescue Beauty Lounge Orbis Non Sufficit as a base, a mix of Icing Envy and China Glaze Snow for the circuits and China Glaze Cheers To You for the soldering. I topped off with two coats of Color Club’s Speedy. 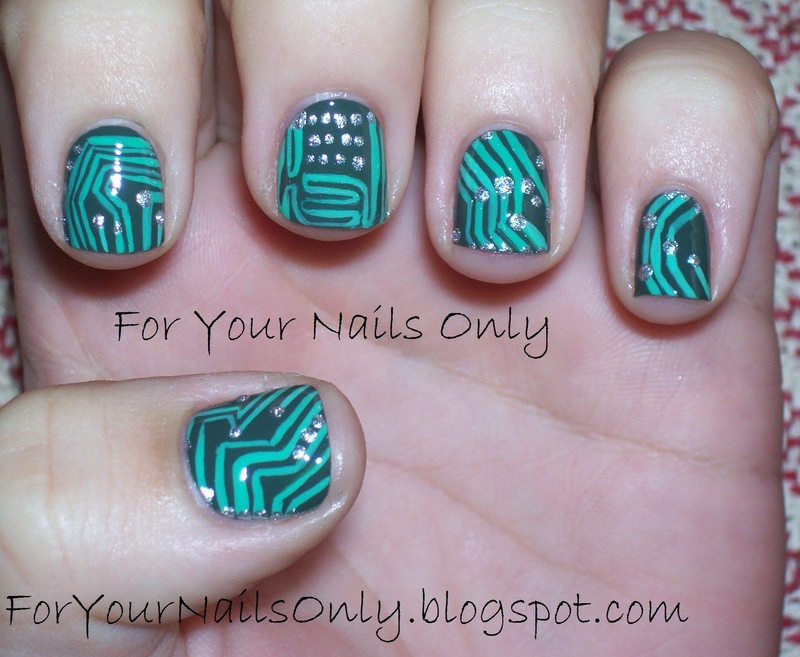 This entry was posted in Nail Art and tagged China Glaze, Color Club, creme, green, Icing, metallic, Rescue Beauty Lounge, silver, teal by Tara. Bookmark the permalink. Your mani looks very interesting and if I'd seen you somewhere, I would have asked you the story behind it.